2,088 pages | 495 B/W Illus. The evolution of the construction industry is closely linked with the introduction and evolution of information technologies. Today, collaboration, distributed document management, and instant communications are joining classic scheduling and estimating applications as the standard tools employed by construction professionals. However, the next generation of information technology applications is already having an impact; the emerging fields of visualization, Building Information Modeling and construction simulation are being applied to projects and demonstrating initial opportunities. This reference set provides a comprehensive perspective on the role of information technologies in the construction industry. Beginning with the seminal works on computerizing scheduling operations, these volumes provide both a breadth of representations of construction technologies as well as depth of understanding in each area. They focus on: 1) traditional applications including scheduling, estimating, and operations simulation; 2) second generation applications including collaboration and document management applications; and 3) next generation technologies including 4-D simulation, virtual worlds, and safety modeling. Within each of these focal points, the volumes provide the reader with a cross-section of papers that introduce both the theory and the application of the technologies. 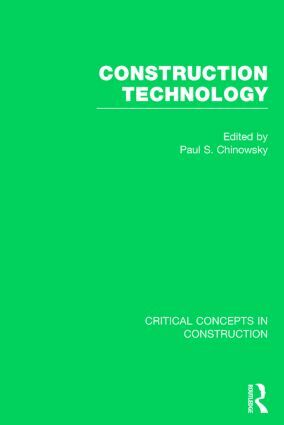 The collection is introduced by the Editor to provide the context of the industry as a basis for Construction Technology emergence and each volume has its own short introduction. These volumes present a comprehensive review of the role of technology in responding to the continuous changing environment of the construction industry. Paul S. Chinowsky is an associate professor in the Department of Civil, Environmental, and Architectural Engineering at the University of Colorado at Boulder and is currently conducting research in the area of high performance organizations in the architecture, engineering, and construction (AEC) industry. He is editor of the Engineering Project Organization Journal. Detailing the evolution and the future of the construction industry, this series from Routledge Major Works deals with important issues that impact construction. From technology to management, the roles within construction are far reaching, resulting in a broad scope of study and research. The series collates the most influential scholarship, with collections edited by experts in the field.